For a work truck, the RAM 1500 is a very good option and it’s available with a myriad of spec and option configurations, but one can be completely customized to tailor a buyer’s specific taste. For a daily driven truck, the RAM range also offers up a good option for buyers too. There are enough mod cons on board to make the truck comfortable and safe, and with the 1500 starting off at $26,495, one can be in your garage from as little as $310 per month. Throw in all the options on the biggest 4x4 RAM 1500 and you’re going to pay around $60,000, which can also get you a well-spec'd RAM 2500 or even a RAM 3500. Choose wisely. In the world of trucks, the RAM range is arguably one of the meanest looking around, and that alone can be a deciding factor when choosing a truck. The design is probably the only one that works with the smaller entry-level models in the range too, the 4x2 regular cab with the 6’4” box is all in proportion. Things are beefy enough that the massive RAM 3500 also looks in proportion. Luckily Dodge has had many years experience with building trucks and that means there’s more to them than the menacing front end. 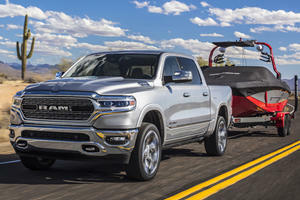 Engine options include a gasoline 3.6-liter V6, a gasoline 5.7-liter V8 HEMI and a 3.0-liter V6 turbo-diesel, along with two 8-speed automatic transmissions, but is it enough to pick a RAM over the rivals? The RAM interiors are much the same across the range; the symmetrical dash is utilitarian in design and while it’s plain, it’s functional and looks good. It’s not an award-winning setup, but it works for a truck that will likely be used as a workhorse. The seating is comfortable with many adjustments (10-way power) that allow for a good position for good visibility. They can also be heated for the colder weather states, as can the steering wheel. There’s a lot of space, even in the smaller regular cab version, but when you go up to the bigger cabs you can fit a sizeable work team in there. NVH is good in the cabin too, the V8 is as quiet as a small capacity motor, but dealerships do offer some MOPAR parts that will make things louder. As for controls, they’re all in the right places and the steering mounted controls keep the driver focused on the road instead of reaching across the vast cabin. Fit and finish is good and differs across the model range, but the wood options are real. The ride differs depending on the choice of engine and transmission, but the most common choice is likely to be the gasoline-fed 5.7-liter V8 and the 8-speed automatic transmission. In this case things are good, the power on tap is enough to move the truck around with enough pace to keep ahead of the traffic if desired. The drive in the 4x2 or the 4x4 is also much the same, the only differences likely to be picked up when towing a bigger load or on surfaces when traction is compromised. The 4x4 obviously being the better option for climates where things are wet and slippery. The truck is big, and the suspension is tight enough for normal driving, a bit of a push will show up in the body roll. Acceleration is good on the V8 model and the transmission does a steadfast job of changing the gears. As you rise through the range, steering and parking becomes more of a task, but that’s expected. With the RAM 1500 truck being able to be configured with two drivetrain and engine options, performance is a little different. 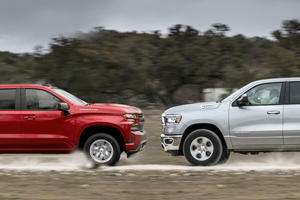 For smaller tasks and general duties, the smallest RAM 1500 fitted with a 3.6-liter V-6 with 269 lb-ft of torque on tap works well, but for more power and usability it would be best to option the RAM 1500 with the V6 turbo-diesel that has torque up at 420-lb-ft, 20 lb-ft above the 5.7-liter V8. This is good enough to pull a load of up to 10 640 lbs. and that’s pretty impressive, especially when this is still the smallest RAM truck in the range. In the RAM 1500 the safety is good, but not really any different to any other trucks that can be had in the ranges offered from most automakers. RAM trucks feature electronic stability control, ABS and driveline traction control and a full array of airbags. Infotainment sees a 6-speaker system in play, but that can be increased to a 9-speaker system if wanted. Navigation is an option as too is the 8.4-inch touchscreen display to head up the infotainment system – standard fitment has a 5-inch screen. One standard feature in the cabin that’s a blessing is the ParkView rear backup camera because parking a RAM takes skill and needs help where available. 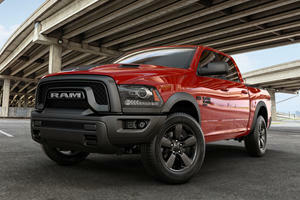 Taste is subjective, but the RAM range is a good-looking one. 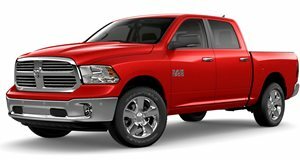 The RAM 1500 model that starts off the range is good, and the amount of configurations that are available means there’s a RAM truck waiting for just about every conceivable purpose, you’ll find listings for over 80 spec, tech and mechanical variations in the model almost eliminating the need for an online configurator. The pricing is similar to that among rival trucks too, so it may just come down to buying with the heart. But what about a smaller version?